Inspiring ingenuity and teamwork are just two words that describe our recent café. 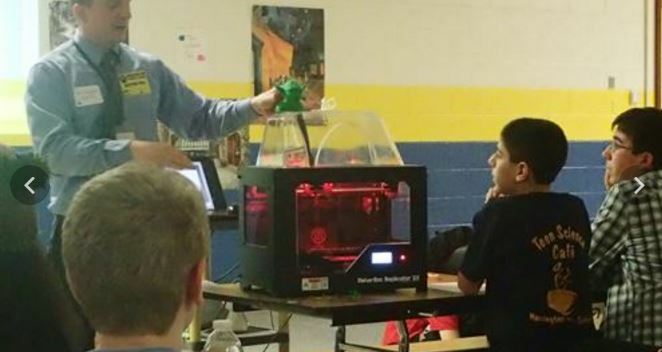 About forty students attended Harrington Middle School’s Teen Science Café on Monday, February 1st, and each one truly enjoyed hearing from our guest speaker, Michael Condurso. He is a technology education teacher and a FIRST Robotics advisor at Lenape High School. The students were engaged in the day’s events, starting with his presentation on the importance of technology education and robotics. He then went on to tell them that making an intelligent and structurally sound robot was not possible without ingenuity and teamwork. Mr. Condurso then shared a video with the group about FIRST Tech Challenge Robotics, as well as an introduction to the advanced robotics challenges that his teams worked on in this year’s high school competition. The students were amazed by a 3D printer demonstration and were quick to ask questions and participate in a lively Question/Answer session. Mr. Condurso left the Teen Science Cafe participants with good advice: things don’t always work out the way we want them to, and it is important to work together to fix the problems. This Teen Science Café event was a huge success! 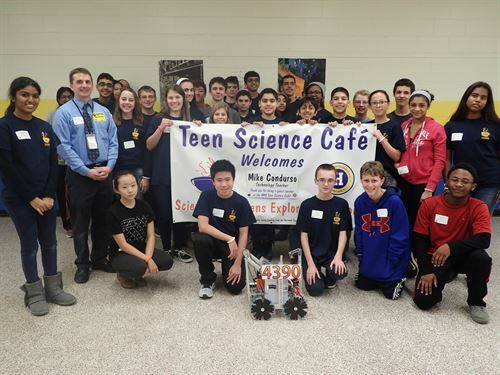 Mr. Michael Condurso had two engaging activities for the students to do, a teamwork activity and driving the FIRST Tech Challenge Robot (made by students from Lenape and Cherokee High School). 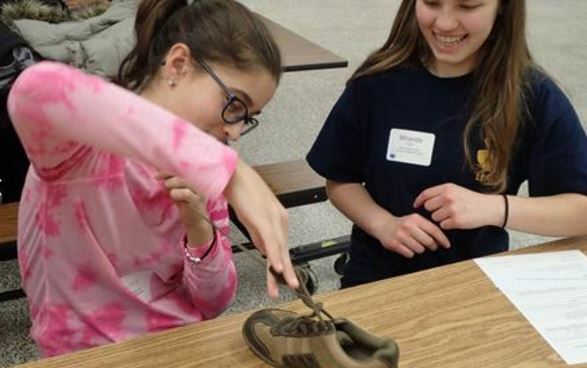 To reinforce the concept of teamwork and “what it’s like to be a robot” the students worked in pairs to do an activity in which they had to tie a shoe using only a pair of pliers. Most of the teams excelled at the activity, working together to effectively tie the shoe within a few minutes. Before the second activity, he demonstrated how his teams make parts for their robots using a 3D printer. As melted plastic was sculpted into a shape, he showed a prepared and detailed creation: a green Yoda figure. Students also got to drive the Storm Robotics FTC team robot, and everyone in attendance was given a 3D-printed bracelet!